in my opinion...: "Never get off the boat!" "Never get off the boat!" 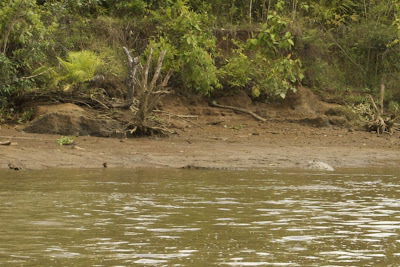 The trip to Sabalo Lodge, up the Sierpe river, was through, literally, crocodile infested waters. Click the image to see a larger version. They are little hard to see but there are two American Crocodiles just moving into the water. The one on the right looked to be about 8 feet long, while the one one the right looked to be about the same. Gives a whole new meaning to the phrase "never get off the boat!"